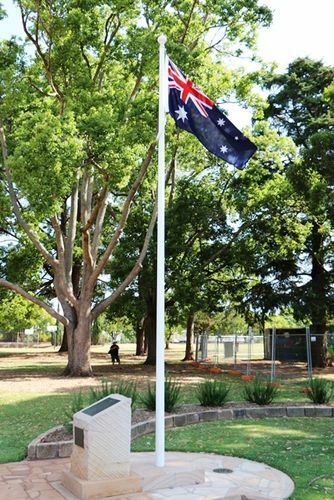 A monument erected by the 11th Light Horse Association of Toowomba commemorates the Centenary of Federation. Newtown Park's history is re-told on cast bronze plaques attached onto a sandstone plinth block. A Light Horseman motif has been included on the bronze plaque in recognition of the 11th Light Horse use of Newtown Park. The Federation of Australia was the process by which the six separate British self-governing colonies of Queensland, New South Wales, Victoria, Tasmania, South Australia, and Western Australia agreed to unite and form the Commonwealth of Australia, establishing a system of federalism in Australia. They kept the systems of government (and the bicameral legislatures) that they had developed as separate colonies, but they also agreed to have a federal government that was responsible for matters concerning the whole nation. When the Constitution of Australia came into force, on 1 January 1901, the colonies collectively became states of the Commonwealth of Australia. This parkland was purchased by the Toowoomba Council in 1912 from Mr Henry Pottinger and opened by the Hon. J G Appel in 1913. With the outbreak of World War I, a military drill hall was built adjacent to Tor Street. The park then became a centre of recruitment and training and was used exclusively by the two local citizen force units, the militia and Darling Downs Light Horse. Regular band recitals and concerts were performed by local cultural groups. Following the Great War the 11th Light Horse returned to the park and the drill hall became their HQ. They held their annual camps here in 1923, 1924 and 1925, the C.O. then being Lt. Col. P J Bailey, DSO, VD. NBE (Order of the Nile), the original Adjutant of the Regiment. A community dance held here in the drill hall in 1923, under the patronage of a former commader of the 11th LH Regiment, Brig. Gen. W Grant CMG, DSO and Bar, NBE (Order of the Nile) was attended by over 600 people. In the 1930's an avenue of trees was planted over the whole park to form the pattern of the Union Jack. During World War II the park again became a military base and acquired a further 20 buildings. It was used extensively for rest and recreation leave by American forces from the Pacific region.